With so many dessert options available these days it is difficult to know if what you are eating is good or bad for your health. Here are the Top 5 Reasons why eating Gelato is Good for you! No artificial flavourings or ingredients – The fruit flavours (ie: Lemon, Mango, Strawberry, Passion fruit, etc) are all created using fruit pulp, sugar and water which means they are full of natural ingredients, vitamins & fat free. Low Fat & Calories – Gelato is only 6 -10 percent fat, whereas ice cream can be as much as 14 – 18 percent fat. Fresh ingredients – High in calcium, protein, and B vitamins! This makes gelato a dessert that is actually good for your health! Has More Flavour Than Ice cream – With less fat content Italian gelato is served at 5 degrees warmer than American ice cream making gelato flavours much more intense and creamy. Produced in Small quantities – By producing gelato by hand in small batches there is no need to over flavour unlike ice cream which often contains many artificial flavourings and produced in large quantities for the mass market. 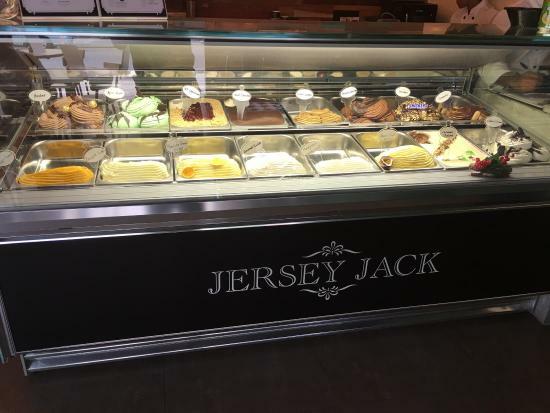 Jersey Jack Gelato is a producer of high quality gelato and has been in operation since late 2014. At Jersey Jack we strive to meet the demands of being an Artisan and adopt the philosophy to ensure our customers experience the true taste of authentic Italian gelato. We constantly search for the finest ingredients and have an intimate relationship with our suppliers.